If you are in the market for your next people-moving family vehicle, then Sanford Honda has a vehicle that you’ll want to come and test drive before making a decision — the 2016 Honda Pilot. Capable of accommodating an impressive array of people, pets and cargo, the redesigned 2016 Pilot is a safe choice for parents — for many reasons. In fact, the new Pilot from your Honda dealer near Raleigh features award-winning safety tech like advanced air bag system, a multi-angle rearview camera, and forward collision as well as lane departure warning that has earned it a 4-Star safety rating (out of 5 stars). And of course, when shopping for a family vehicle, interior space is always an important factor. With three rows of seating and a surprising amount of room, a Honda Pilot in Sanford is a perfect fit for families of nearly any size. The 2016 Pilot is big enough to fit in 8 people with those three rows of seating, and also boasts more than 150 cubic feet of passenger volume to fit in all of your passengers and cargo. Speaking of cargo — when you have more stuff than people to carry, there is a very useful cargo volume of 83-plus cubic feet behind the front seats with the two rows of seats folded flat. So you’ll have plenty of room to pack in some materials for home projects when you are not toting the kids around the town. 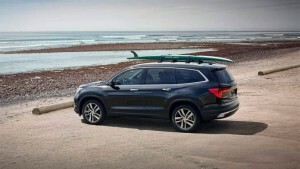 And the Pilot has the power to haul all of your crew and your stuff because it is driven by a powerful 250-horsepower V6 engine with a towing capacity between 2,000 and 4,500 pounds, depending on the model and trim. Don’t worry — despite all that power, it still drinks lightly at the gas pump with its fantastic fuel efficiency of up to 27 miles per gallon on the highway will keep more money in your pocket and is quite budget-friendly — especially when you consider its amazingly affordable starting price of just $30,145 for a base model Pilot LX. So why put off getting your new family vehicle any longer? Pack up the whole family and visit Sanford Honda today to test drive a 2016 Honda Pilot. * 19 city/27 highway/22 combined mpg rating for 2WD 6AT models. 18 city/26 highway/21 combined mpg rating for AWD 6AT models. 20 city/27 highway/23 combined mpg rating for 2WD 9AT models. 19 city/26 highway/22 combined mpg rating for AWD 9AT models. Based on 2016 EPA mileage ratings. Use for comparison purposes only. Your mileage will vary depending on how you drive and maintain your vehicle, driving conditions and other factors.